Don’t tell me you don’t like meatloaf! It is still one of my favorite dishes my mom makes. Something about ground meat, spices, and ketchup reminds me of home. Usually, no two meatloaves are the same, and maybe your memories aren’t as pleasant as mine. That is okay. I still want you to promise me you will give this one a try. I swear, it is NOT your mama’s meatloaf. 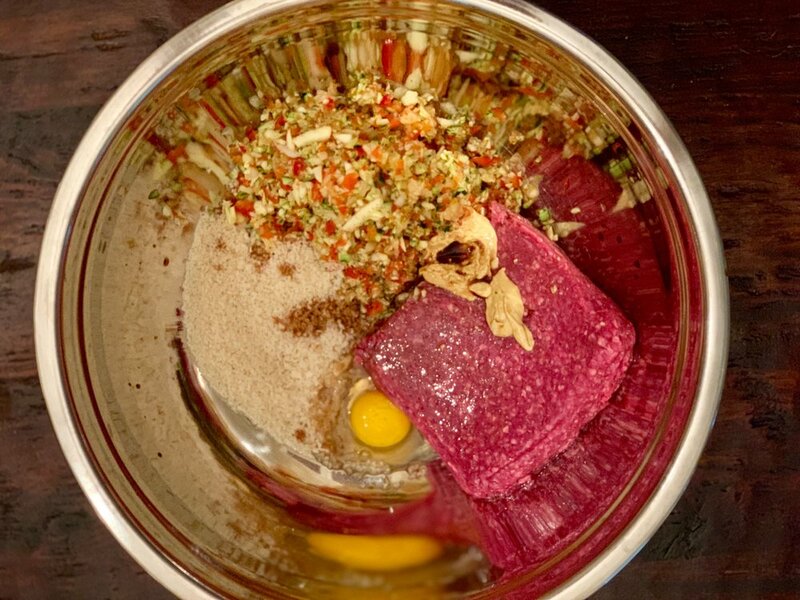 There is no reason wasting time dicing vegetables if you have a food processor and it is all getting mix together anyway. At least that is how I see it. I keep it simple, cut up my vegetables and let the food processor do the heavy lifting. BOOM! Look how pretty and tiny those vegetables are all together. Makes it less likely your picky family will pick them out of your meatloaf. Next, you will mix all the ingredients except the BBQ sauce into a big bowl. Spray a 6 x 9 or one size larger with non-stick spray and add in like a traditional meatloaf. Then top with the BBQ sauce. Bake at 350F for 30-40 minutes. You wan the internal temperature to be around 155F. How you serve it is up to you. The meatloaf rates as your protein, but doesn’t have enough vegetables in it to be a serving. Get creative with your sides. Tonight the Turners had air fired potatoes. Sadly, there was no other vegetable on my plate. Not every meal rates 100. Ha!